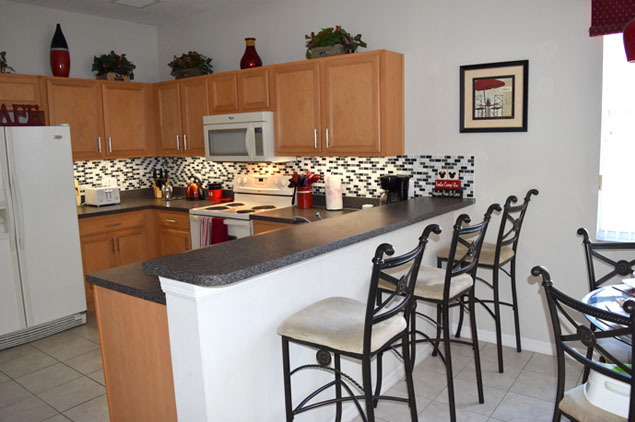 Explore and read about Florida Calabay Villa's great facilities below, or click here to go to the photo gallery for a better look at the luxury that you could be enjoying. 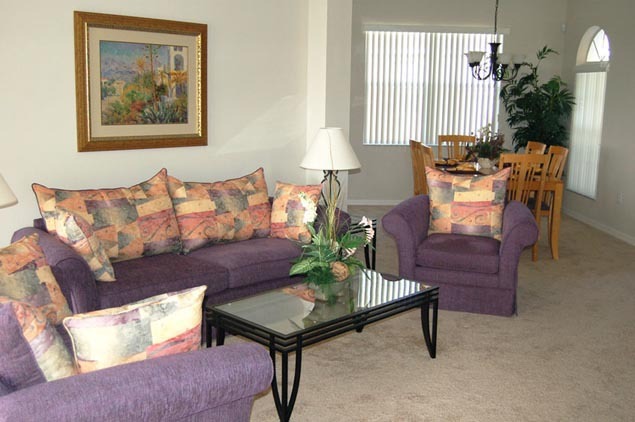 The spacious, open plan lounge area is at the heart of your holiday home. It comprises a comfortable three-piece suite, coffee table, side tables and a 42" HDTV with cable and digital channels, including English Premier League football (soccer) and Premium Movie channels. There is also a Blu-ray player equipped with a large range of Blu-rays and DVDs. The large patio doors look out onto the south-facing pool area. This elegant and light space has a large dining table with six chairs - perfect for family gatherings or entertaining with a meal in the evenings. 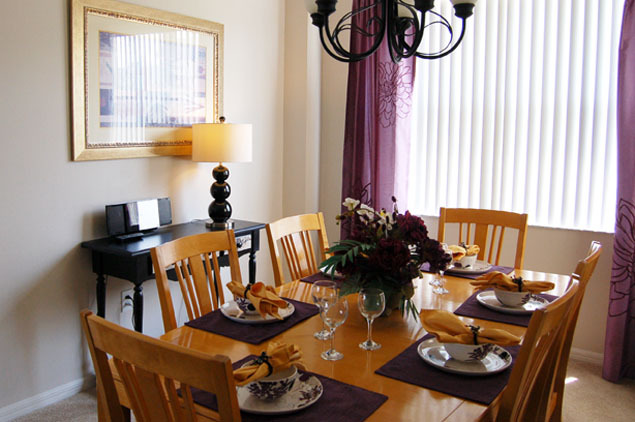 The console table holds an iPod dock and CD player for some entertainment while you dine. The fully fitted kitchen includes a dishwasher, large fridge-freezer with ice maker, microwave, full sized cooker-range and a full supply of small appliances and cooking equipment to ensure you have everything you need. 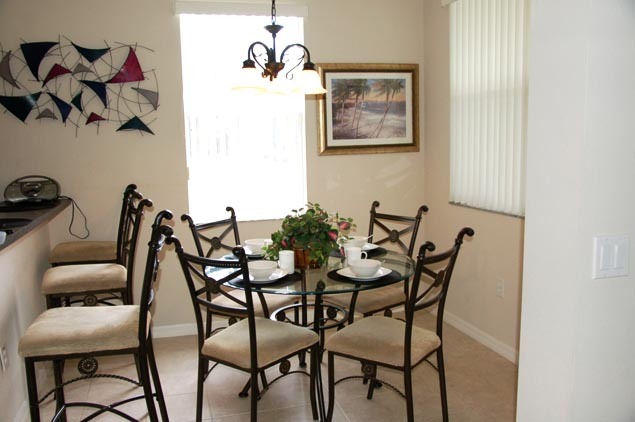 There is a nook with table and chairs, and a breakfast bar with stools - many options to suit your dining preferences. 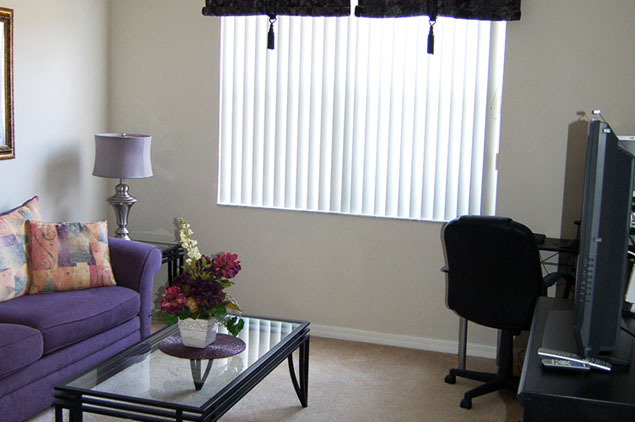 Double doors lead from the entrance area to a separate, second reception room equipped with sofa and coffee table, 37" LCD television including premium cable and digital channels, DVD player, plus a Nintendo Wii and Sony PlayStation 2. There’s a selection of popular games and DVDs for your use, along with books, board games and playing cards. Free High Speed Internet access for your laptops and tablets, so you can check your emails and find out the latest times and schedules for the parks. 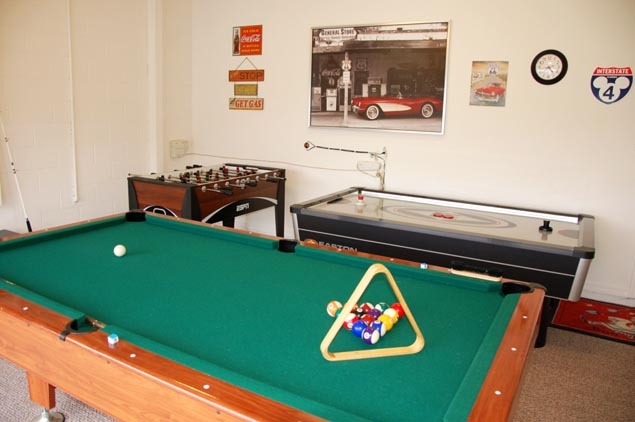 Equipped with a Pool table, Air Hockey and Füsball table to keep adults and children alike occupied, if you can stay away from the parks and the pool! Also enjoy a round of golf with with our golf clubs for your use (2 sets). 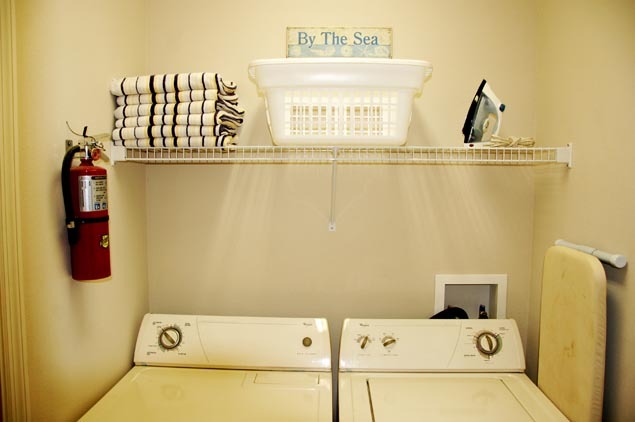 Fully equipped with washer, dryer, ironing board and iron. The ground floor master bedroom looks out onto the pool area, with direct access on to the lanai. With a brand new king-size bed, bedside cabinets, chest of drawers and a walk in wardrobe, it’s the perfect place to retreat for relaxation and privacy. 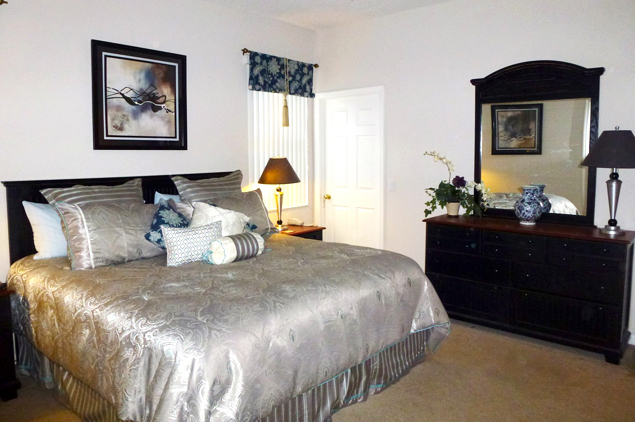 Also includes a flat screen TV with premium cable channels, DVD player and a bedside radio alarm clock with iPod dock. The fabulous en-suite bathroom features a large corner bath, spacious shower room, and twin basins with a range of storage cupboards. Large en-suite master bedroom with a brand new king-size bed, spacious wardrobe, TV with DVD player and bedside radio alarm clock. En-suite bathroom with shower fittings over the bath. 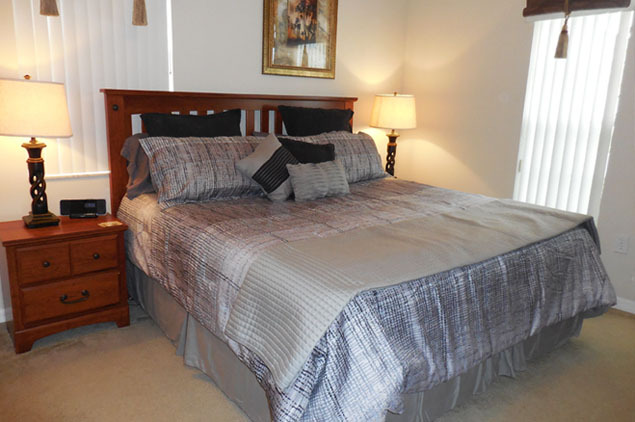 Another spacious master en-suite, with a Queen-size bed, dressing area and full shower room. Also includes a flat LCD TV, DVD player and a bedside radio alarm clock for your comfort and enjoyment. A Peter Pan-themed twin bedroom which is light and spacious, with plenty of storage. This bedroom has an en-suite, with shower fittings over the bath, TV and a bedside radio alarm clock. There is also a full-size crib. A second twin bedroom with en-suite bathroom, with shower fittings over the bath. 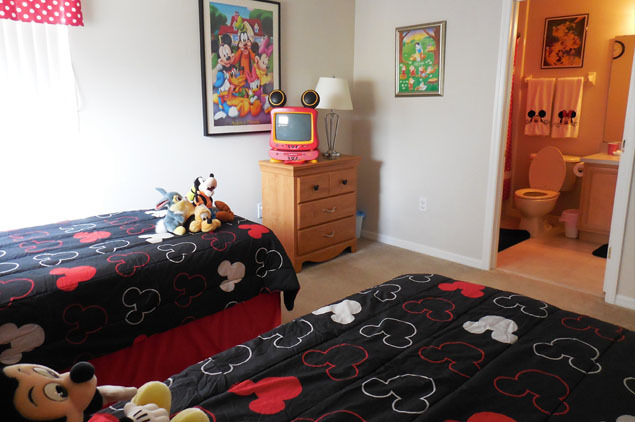 The Disney pictures, and Mickey Mouse TV and DVD player are perfect for children and adults alike. Step out into the fabulous pool area, where there is plenty of room to relax on the sun loungers, or enjoy al fresco dining. 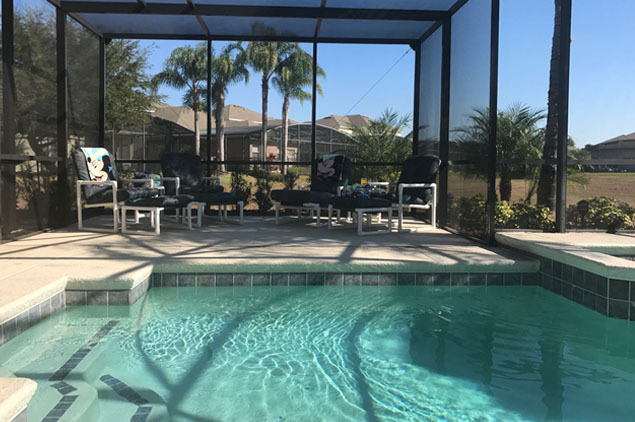 The lanai has a cooling ceiling fan and affords shade from the Florida heat, whilst the pool deck aspect ensures maximum all-day sun. The spa is surrounded by lush palms and plants for a truly tropical ambience. 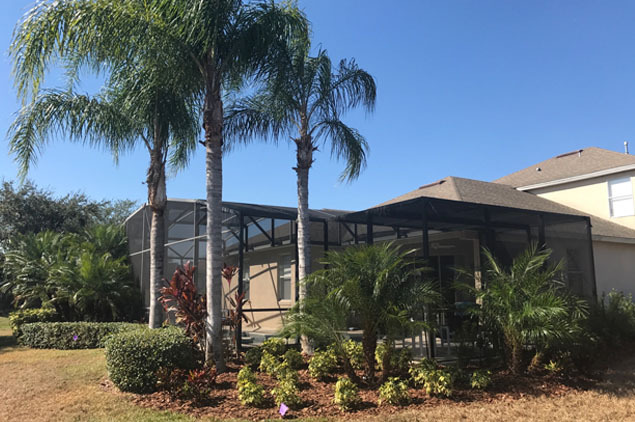 The large fully screened pool and spa can be heated if required, and the extended deck, looking out over open space, provides plenty of room to enjoy the sunny Florida weather. Just 1 minute from the villa, Calabay Parc at Tower Lake has its own private boat ramp and fishing dock.